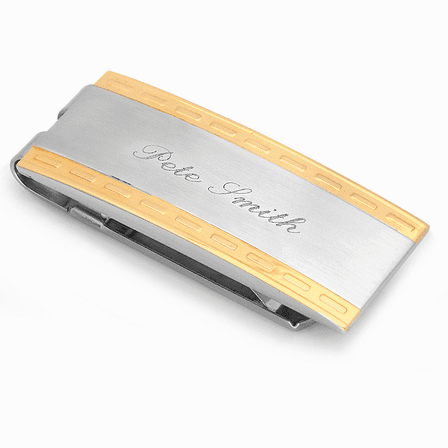 Elegant vintage design and contemporary mechanism combine flawlessly in the Milan Collection money clip. 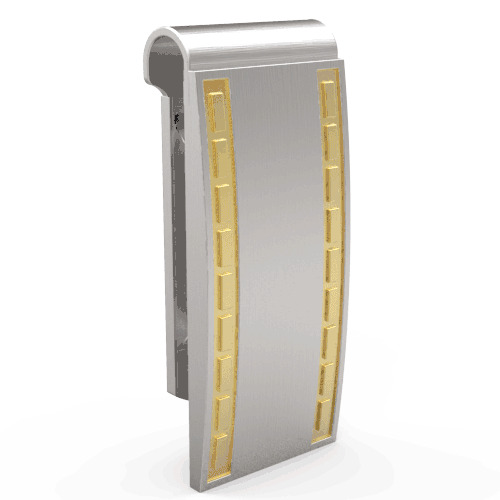 The design is satin-finish silver stainless steel, bordered by a gold-plated embossed ribbon on both top and bottom. The spring-loaded mechanism allows for easy opening and closing to remove or add cash, and securely grips up to 25 folded bills, as well as a few credit cards. Select free custom personalization to add a unique and thoughtful touch to your gift! Can the name be in a straight line like the picture. I had the size at 50 will that work? We always engrave in a straight line so you'll have no problems there. The size that works for you will vary depending on how long the name is. Press the preview personalization button to get a simulation of how your engraving will look. How thick can the clip hold? Sometimes I include credit cards and the money clip can't hold everything. 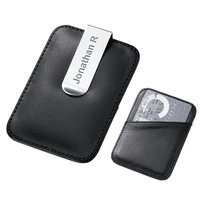 This money clip is spring loaded, which gives it a little more room to hold a credit card or two in addition to a billfold. The spring can be pressed open to about 1/3" wide. Can i get it engraved in gold or black writing? Sorry, but this can only be engraved into the metal, so there is no color available. 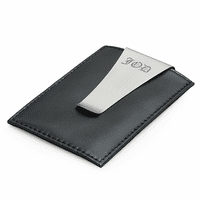 This money clip is made of stainless steel. 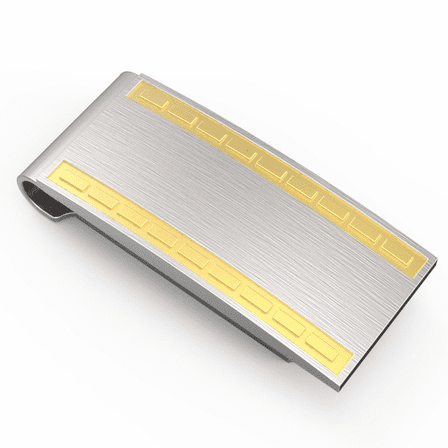 How many characters in two lines can you engrave on this money clip? Will this fit 'Mountains Are My True Wealth'? Yes, we could fit that engraving. Instead of adding your instructions in our engraving instructions area, add them to our comments section when checking out. The letters will have to be smaller but we'll make sure it still looks good. Will the gold accent wear off with continual use? It should not but this money clip, and all of our money clips, has a lifetime guarantee. After you place your order, just hold onto your order # by saving your confirmation email. If you ever need a replacement for ANY reason, just email us with the order # and we'll ship one immediately. I ordered for my husband for Valentines Day. It is exactly as it looks in the picture. Nice weight. He likes it and it holds a lot. I especially love the free engraving. The money clip itself is exactly what I wanted. I would have liked the print to be a lot larger and darker (more visible) like it looked on the original website for Executive Gift Shoppe. I am disappointed although it is a nice clip they failed to engrave it. ConsMy receipt reflects that it was engraved but it was nothing. My son needed a money clip and this one seemed like it would work well. It is very nice looking and I think he will really like using it. I ordered this item as a wedding present for my groom with the date of our wedding engraved. I was very pleased with the quality and my prospective groom loved it! Loved it. The quality was very good engraving perfect my friend really enjoyed it. I was very delighted when I received this product! It was a gift for my grandson, and it was very important to me to give him something elegant! ProsI thought the money clip was of very high quality and the fact that I was able to have his name engraved on it was absolutely terrific! This money clip is so beautiful and useful that I wish i'd had it many years ago. Love it. All there is to say. 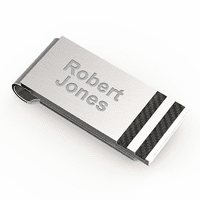 The money clip itself is quite nice, but if I had to order it again, I would only have the first name engraved as it's a bit tight with both first and last names. Otherwise, I am very pleased with the ease or ordering, free shipping, quality, and price of the product. This money clip is one of the best I've ever had. Understated, functional and durable. A winner. ProsSleek and easy to slide bills into. This is a very nice money clip. Engraving is beautiful. And is very well done! I highly recommend this! Price is also great! Item was as advertised and more, excellent workmanship and engraving! Got my clip and am very happy with the quality and appearance. Would highly recommend Executive Gift Shoppe to all my friends. Shipping was fast, product was high quality, engraving came out great. Highly recommend. Bought for my husband Christmas gift. He was pleased with design. Thank you prompt delivery and beautiful engraving. Follow reviews and increase the font size .... I didbut could have gone up another point. I am very happy with the service and quality of this item. I purchased it for my husband to celebrate our 46th anniversary. The item was engraved and shipped in a very short time and I received it in time to give it to him. Thank you for your quality service. Very nice!! Engraving is beautiful! I bought this clip for my boyfriend's birthday. It arrived quickly and the engraving was beautiful. 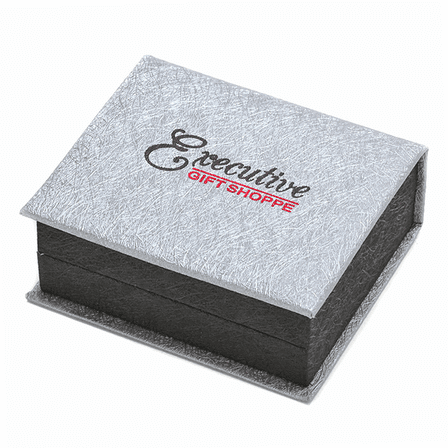 I made an error when typing and the team at Executive Gifts replied promptly to correct it. Excellent item, I look forward to future purchases. ProsQuick shipment, speedy response via email. ConsWould like engraving a little bit bigger, but still beautiful. It was eactly what I wanted. The actual item is as nice as the picture if not nicer. 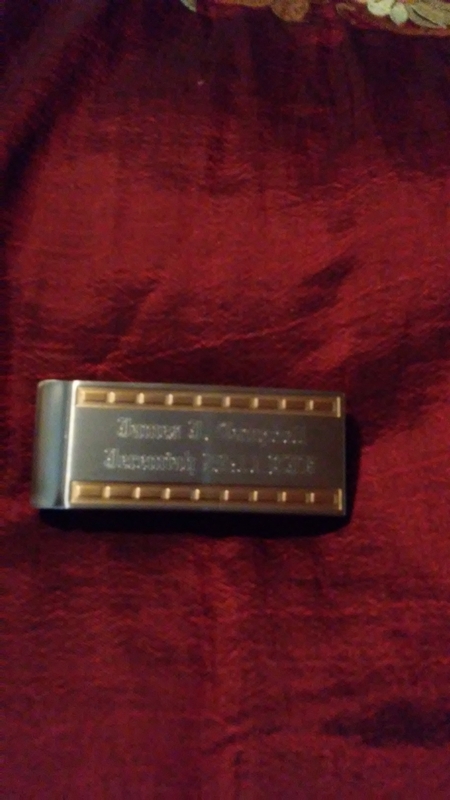 Got several as groomsmen gifts with their names and wedding date inscribed. Beautiful! The inscription was high class too.